God’s House is completely transparent with the exception three rooms a Prayer Closet, a Bath Room, and Safe Room. It is in the Prayer Closet where we can have intimate conversations hidden from the world and prying eyes with God. One thing I have discovered wherever I open the door walk in and shut the door behind me not only can I get intimate with God I also get intimate with myself, discovering things about myself I would never have discovered any other way. In addition to the normal use of a bathroom the Bath Room affords one a place for cleansing the soul/spirit. You wouldn’t think you would need a Safe Room in God’s House after all how much safer could you be living in God’s House? The answer to that is really very simple, if you are reading this then you are living in God’s Glass House on Earth, this isn’t God’s Forever House. 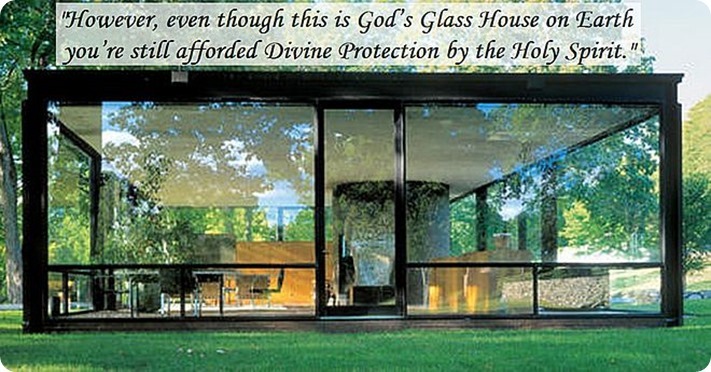 However, even though this is God’s Glass House on Earth you’re still afforded Divine Protection by the Holy Spirit. But when living in a glass house people can see in and you can see out. What you see in the outside world can be very disconcerting and challenge your faith so by going in the Safe Room and shutting the door you’re not only temporarily shielded from the outside world while at the same time the Holy Spirit is strengthening your faith.